08:10 – David and I are just about to cross the breakwater and walk the 2.5 miles to Long Point. Before I finish this walk, I’d like to thank everyone who has helped me along the way – my friends, my family, the folks who have teken me in, given me food, or just stopped to say Hi. For everyone who took a minute to write a message, even after this smelly bearded vagrant ran approached them waving a pen and a notebook and blathering about the government. This walk was dedicated to our elected leaders who run for office simply to serve others; it’s dedicated to my mother, Rita Hill, who passed away last summer. And this walk is for all the people of Massachusetts, who brave stinging winters, scorching summer, rainy springs and beautiful autumns, and cry when the Red Sox lose. I’ve been from Greylock to Long Point, and this walk is for all those who call Massachusetts home. 07:00 – This is it, the final push. Three miles through town, 2,5 miles to Long Point. It’s wild out here – windy, cold and rainy, and it’s getting worse by the hour. The sooner I get this done, the better. Well, at 6:00 pm, I made it to the Provincetown line! Yay! Almost finished! 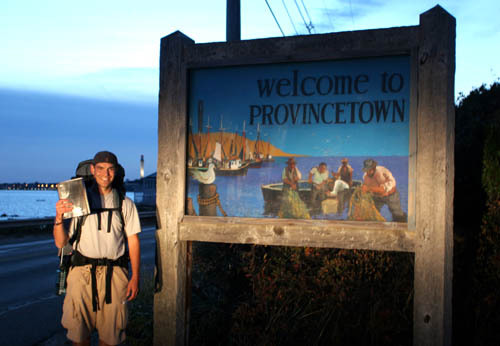 I didn’ t realize that PTown was so long – about three miles from end to end! Since it was already getting dark and cold by six o”clock, I wrapped things up and went back to Brewster with David and Julia, a great couple who took me in for the night. I had walked about 19 miles since about 7:30 that morning. David could understand my pain – when he was 19, he rode his bicycle 8300 miles, from Cape Cod to Florida to California – and back. Anyways, tomorrow David and I will begin where I left off at the town line, walk along Commercial Street through P-Town (3 miles), over the breakwater, over that little spit of land that juts out (2.5 miles), get my picture taken happily dipping my toes in the furthest reached of Long Point, and then walk back over the spit of land (another 2.5 miles) and back into P-Town, ready to enjoy Saturday night’s Halloween festivities. Now, there are only three problems, um, considerations – First, it is suppose to rain biblically tomorrow, second, it is going to be windy and COOOO-OOOOO-OOLD on that exposed strip of sand, and third, crossing the breakwater from PTown onto the spit is dependent upon hitting the low tide at 9:57, which means we need to cross at 8 am, which means we need to start walking through PTown at 6:30 am, which means we need to leave Brewster at 5:45, which means we get up at 5:15. That’s five hours. So, I should try to get some sleep. By the way, even once I walk out to Long Point, the furthest tip of Massachusetts, this project is not finished. There is still something else I need to do – but I will explain that later. Two of the most common questions that have come up since I wrote the FAQ are 1. How many days have you walked? and 2. How are you getting back home. 1. I started walking on OPctober 4th. I walked for eight days, from Williamstown to Worcester. I took four days off at home in Leicester. Then, by the time this trek has finished, I will have walked another ten days – so, in total, 18 days to cover about 280 miles. 2. When I hit one ocean, i am going to turn around, and walk to the other! Seriously, since I just missed the ferry season which ended in early October, my friend Jen is coming to down from New Hampshire to drive me back home to Central Mass. I don’t believe that tomorrow is the end of the trip!! just in time – my shoes are falling apart!! PS Happy Birthday Paul G!! 17:00 – Rt 6A is following the inner coastline of the Cape, and small cottages and motels line the street. I just rounded a bend and I can see Provincetown in the late afternoon light, out over the sparkling ocean, and under the silhouetted lighthouses. 16:00 – Seven miles to Provincetown… 120 minutes to get there. 12:40 – On Rt 6. Just broke into Truro. PTown 11 miles away. By the way, there really were coyotes outside my tent last night. I could hear about a dozen of them baying and howling in the woods on the the other side of the rail trail. Not close enough to stick my hand out and pet, but a little too close for me. I guess coyotes have been a problem on the Cape this year … my friend’s parent’s had one shot in their yard a few weeks ago. It’s getting colder at night, colder during the day, darker earlier, and now coyotes… I’m glad this trip is wrapping up! !